Before Alabama and Texas A&M faced off on November 10, 2012, someone in Alabama decided they needed t-shirts made specifically for that game. I have no clue why the nation’s number one ranked team, or anyone affiliated with it, would feel the need to make a special t-shirt for that particular game but they did. Alabama was ranked number one in the country at the time of kick-off, and they were also the defending national champions. Alabama had also won the national title as recently as 2009 as well. The 2012 season is Texas A&M’s first as members of the SEC. 2012 is also the first time Texas A&M had traveled to Tuscaloosa, Alabama, for a football game — all the previous meetings between the two schools had been elsewhere. Due to the circumstances surrounding the game, the creator of this particular t-shirt felt that they should let A&M know that as the newest SEC member, the Aggies were way out of their league. 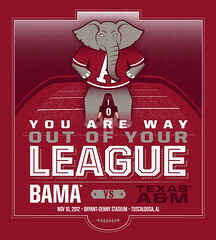 I am thinking the commemorative t-shirt will actually be more of a keep-sake considering Texas A&M won the game 29-24. This entry was posted in 2012, Alabama, SEC, T-Shirt, Texas A&M by Travis Normand. Bookmark the permalink. That’s karma for you. Glad to see that the SEC faces the probability that they will be shut out of the BCS Title Game. It gives me a warm fuzzy feeling. Yes, and Karma is not very nice..! the arrogance of the SEC and alabama in particular has gotten to the point where it has become more than annoying. hopefully, they remain out of the BCS picture for the rest of the season. Well, with Oregon and K-State taking a loss, it looks like Bama might get back in there after all. Well, Bama took a nap and let LSU beat them last year too — wasn’t fatal then, but it might be this year. You are right. We will have to wait and see. This is way too funny. I’m borrowing this for tomorrow’s post, with credit of course. Thanks. Please do! All I ask is that (as you said) you tell them you found it at OnePointSafety.com. I appreciate it!! Just another Aggie here with a blog about college football…!